Svíčková, or svíčková na smetaně (Marinated Beef Sirloin) is a popular Czech meal. It is made of roast beef, usually larded, with a thick sauce of carrot, parsley root, root celery, and cream, spiced with black pepper, allspice, bayleaf and thyme and boiled with doublecream. Left: Svíčková na smetaně served with dumplings and cream. 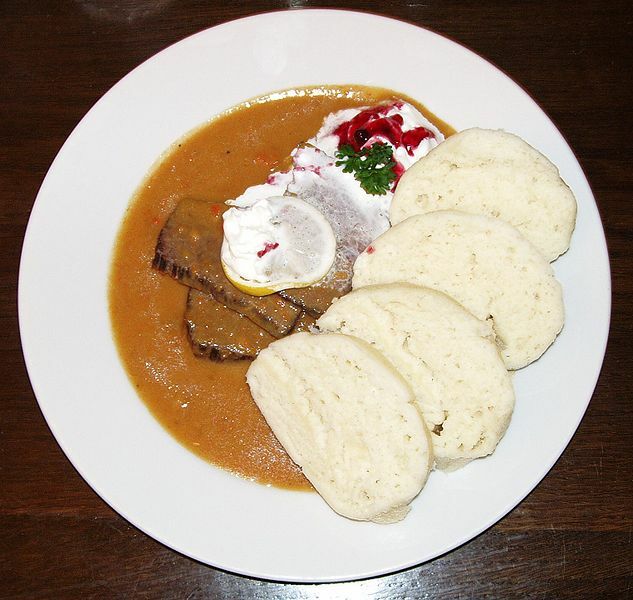 Svíčková na smetaně is served in many restaurants around the Czech Republic, and is served with knedlíky, or dumplings (wheat or potato based, although only wheat dumplings are served with Svíčková). It may also have a cream topping, a teaspoon of cranberry compote, and a slice of lemon. It is one of the most popular foods in the Czech Republic, and is often served with beer. Knedlíky (boiled sliced dumplings) are one of the mainstays of Czech cuisine and are quite often served with meals. They can be wheat or potato based, and are sometimes made from a combination of wheat flour and stale bread or rolls. They are typically large and served cut into slices, in contrast with the smaller dumplings found in Austrian cuisine. Only potato-based dumplings are usually smaller.